This beautiful Mediterranean Orzo Salad is stuffed with veggies and comes together in less than 20 minutes. It’s fast, fresh and easy to prepare. Just the way we love our food around here! This salad is more like an antipasto pasta salad if there is such a thing. We added salami and artichokes to kick up the flavor factor! 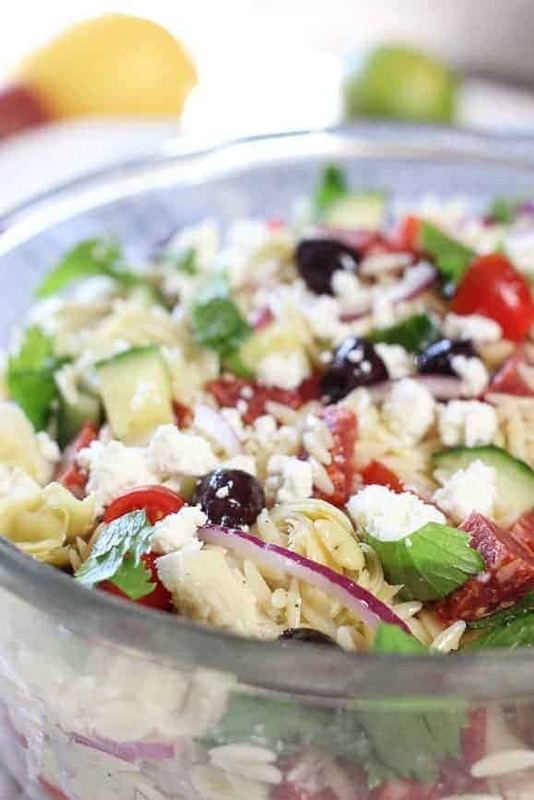 Why we love this Mediterranean Orzo Pasta Salad! Orzo is the new Penne! If you havn’t tried this rice size pasta you are in for a real treat. It has become a dinner staple at home because it is so quick cooking and alot less filling than full size pasta. Check out all our ORZO RECIPES HERE! 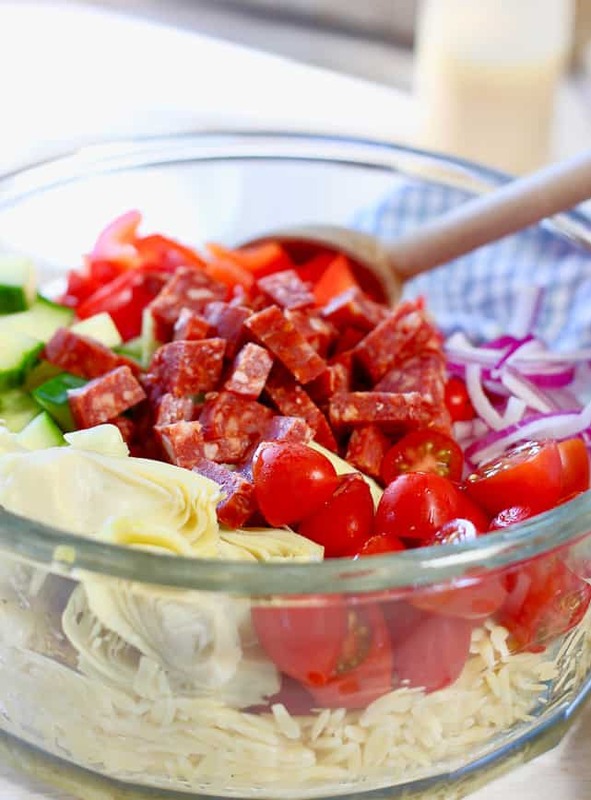 You can get very creative with this salad, using ingredients you already have on hand. Add in garbanzo’s , peppercini and roasted red pepper to name a few. Serve with grilled chicken or fish and you have a whole meal. This makes a big batch…hello lunchbox! 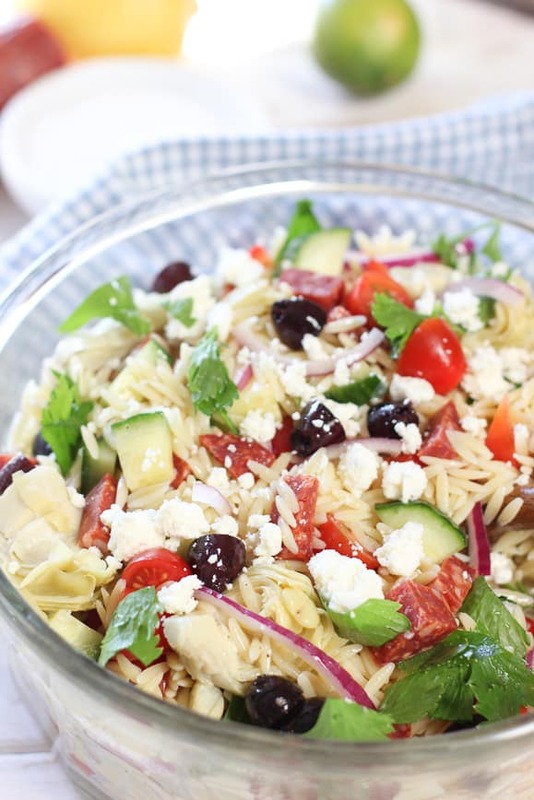 We tossed this Mediterranean Orzo Salad with our 3 Minute Lemon Dijon Vinaigrette. It has just the right amount of zing and so much better than the store bought stuff. We love to create recipes with orzo pasta and have about a dozen of them. Two of our favorites are this Shrimp and Orzo Skillet that is done in 20 minutes! Or this Chicken and Orzo skillet another one pan wonder! And don’t forget to take a peek at our new YouTUBE channel and subscribe! 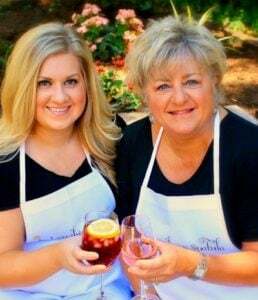 We are loading up video’s of your favorite Laughing Spatula recipes! 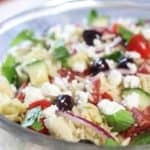 This beautiful Mediterranean Orzo Salad is stuffed with veggies and comes together in less than 20 minutes. It's fast, fresh and easy to prepare. Cook Orzo until tender. About 9 minutes. Drain and rinse until pasta is cool to the touch. Combine remaining salad ingredients with cooked Orzo. Toss with out 3 Minute Lemon Dijon Vinaigrette ! You won't use all the dressing. Add enough to cover the salad and save the rest to add tomorrow to freshen it up. TASTE! More salt? More pepper? I laughed out loud at your spelling conundrums. I live near the Mediterranean Sea (30 minutes from the coast in Turkey) and I usually can’t spell it with help either. I’ve got a lot of vegetables in my refrigerator right now and the are begging to be in a salad like this. Thanks for the inspiration. Hi Sandi! Lucky you! I don’t get to go until I can spell it. Might be awhile…. Perfect light dinner and leftovers for lunch idea! I can’t spell calendar – we all have a word 🙂 Don’t know what I did before Google. Oh, man. Olives, artichokes, feta, salami… this is basically ALL my favorite things in one dish. Med flavors are definitely the best– however you spell it! Orzo is the penne! Whenever I make it for my husband he’s like, “Wow, this rice is so good!” Ummm, it’s pasta silly guy. 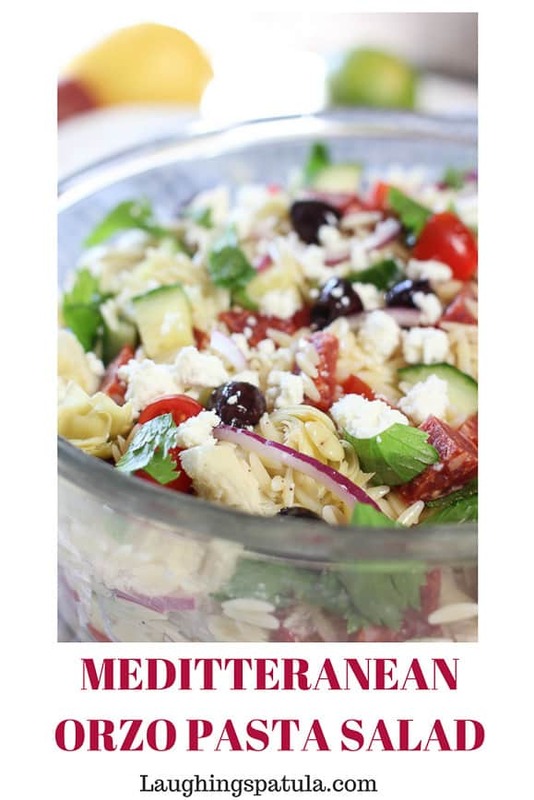 This Mediterranean pasta salad sounds delicious! Would love to have a big batch in the fridge that I can scoop out a serving with burgers or sandwiches. Yum!